We need your help to save more pups from high kill shelters and puppy mills! Meet Vanilla: Vanilla was saved in as result of a puppy mill bust in South GA, where 300 German Shepherds were kept in deplorable condition. The dogs were living in feet of mud and feces and water, most with no dry place to go. Their kennels were so rudely constructed that many did not even have a gate, dogs had to be hoisted feet into the air to be freed. Vanilla is an older girl, and was hiding in a corner, thin and frail. She is anemic and in very poor shape, but we are turning that around with good care and lots of TLC . Meet Irma. She is just a baby, only 4 months old when we took her in. Irma came to us from a local animal control. We thought we were getting a happy, bouncy, playful and healthy puppy. Sadly, Irma had an obviously hurt back leg. She had a significant limp and could not play for more than a few minutes without having to stop due to pain. After several visits with our great doctors, it was determined that Irma needed an amputation. Meet Ranger. He was shot and taken to an emergency vet clinic by the police. His owners were notified and came to pick him up - but declined all medical treatment. He came to CPR 3 weeks later, with an open and bleeding wound and a leg with multiple fractures and infection from being untreated since he was shot. Ranger needed a surgery to install an external metal stabilizer called a fixator, to try and keep his bones still so that they could heal. Meet Klaus. 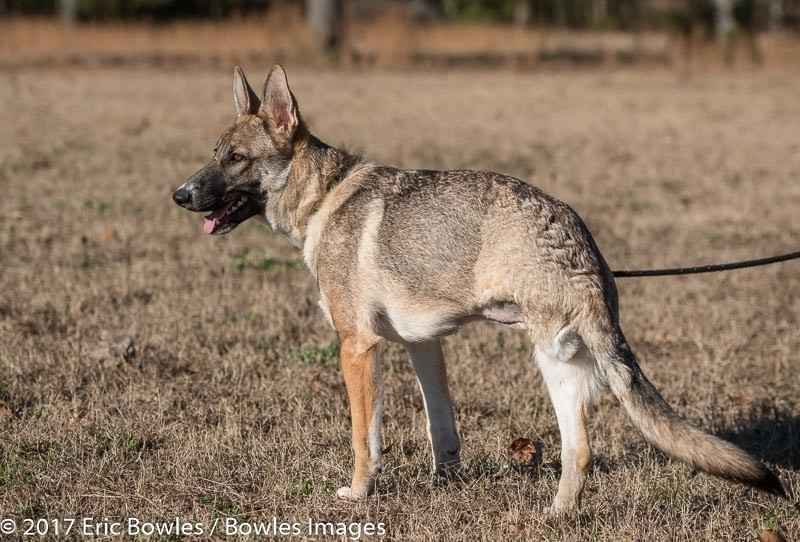 Klaus, just 16 months old, was owned by a dog trainer and was supposedly in DC in training as a security dog. Instead, he was found in a local animal control weighing only 50 pounds. After medical intervention, food and supplements, Klaus gained 26 pounds in 3 weeks. These are just a few of the dogs your donations have allowed CPR to help in the past few months. It is with your continued support that we can keep up this good work. In honor of Berkeley, a sweet German shepherd shot and killed by a neighbor in Duluth/Berkeley lake, GA! I'm donating in memory of Berkeley, a Duluth, GA GSD who is gone far too soon, but will never be forgotten. May justice be served. Bless you for the good work that you do! Thank you for saving the GSD's from the deplorable conditions in South Georgia. I am so thankful for the lifesaving efforts that CPR provides to neglected and abused dogs. Made in honor of "Snoop Dogg" and his human, Rebecca Kay Sapp, winners of our Facebook Cutest Dog Contest. Thank you for all you do for the puppies! It's so wonderful that you were able to rescue the German Shepherds in south Georgia. Keep up the amazing work. My heart breaks for those little souls. I wish I could give more. Please do what you can for these innocent creatures. Bless you. Have a special place in my heart for shepherds. My husband had one in Vietnam Nam war. USMC scout dog handler. Saved his life several times.